Disclaimer: This blog (for once) contains no Bowman cards, packs, or blasters. Instead of Bowman, I thought I would get back to what I like most in collecting- my PC. Despite the fact that I love Robbie Cano, this monster MVP-type season (.371 BA, 12 HR, 46 RBI) he is having is creating a bit of a frenzy over his cards. Not that I don't want him to do well, but more people to fight with that are just jumping on the bandwagon now. 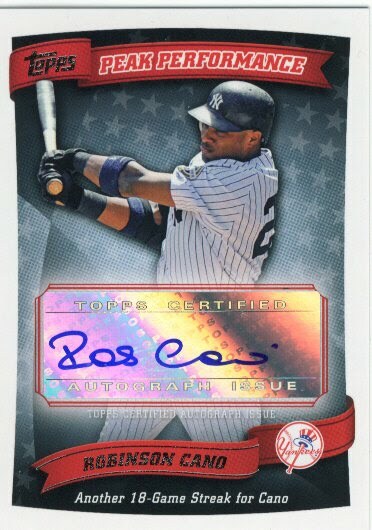 Cano had an auto from 2010 Topps Series 1 and is popular enough to have an auto in 2010 Topps Series 2 as well. His auto is also a Group A this time which I thought was awesome and kind of a bummer because that immediately adds value to the card as a result of it not being in every box. Unfortunately, Adam Lind is not have anywhere near the season Cano is having. He is currently hitting a disappointing .209 and his cards have sunk like a rock. 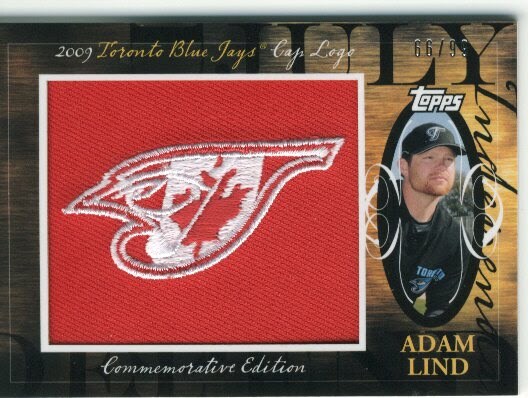 Bonus of this, super cheap Cap Logo card /99 on eBay. I'm hoping that Lind can turn his season around after the All-Star break, maybe some days off to regroup will get him back to his form from last season. The Cano Cap Logo card may be the next card I go after, but it would probably half to be for half the price. I can't really see myself spending much more on a fake patch card. It is nice to think about my PC again and work on stuff that has to do with that... and not chase the golden ticket. I have not been to Target in 24 whole hours. Why is there a Cano picture/autograph on the Strasburg Peak Performance card? Is this another one of those gimmicks? So where did the Strasburg auto 1/1 end up? What the $!%* is going on? Strasburg Superfractor back on eBay? Hobby Surge: Thumbs up or thumbs down? I'm allowed to enjoy a Red Sox story, right? STRASBURG DEMANDS IT: Buy them all! How does Topps celebrate Strasburg's debut? Did Bowman live up to the hype? Blowout Cards posts 2010 Bowman "Superpull"
What do I do with these cards?